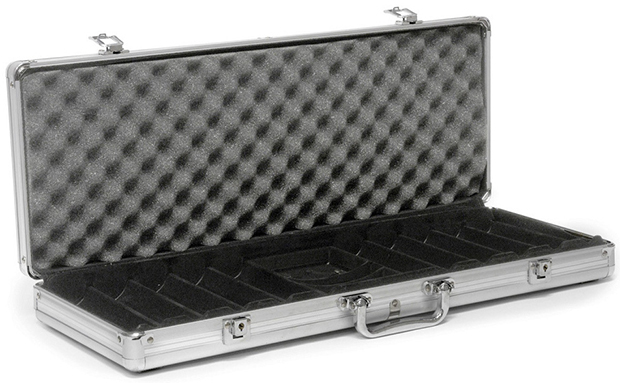 Here is our great deal on a deluxe executive-style locking 500 Chip Aluminum Poker Case. This heavy duty, yet lightweight aluminum poker case has been redesigned with ribbed surfaces and rounded corners for a stronger reinforced frame structure. This stylish aluminum briefcase design contains 10 slots with dividers holding 50 chips each and storage for two decks of cards and 5 dice. The fully lined black velour interior of the case is outfitted with handsome chromed latches, hinges and a handle which is securely fastened for years of use. Don't be fooled by lower quality cases. We have taken great care to ensure this case has the upgraded strength where required.